After four years of planning, the student health center moved in August to its new location in the Old Gym Building, Room B008. The move will accommodate phase two of Lehman’s master plan, which is to build another science building. Cindy Kreisberg, a physician’s assistant, and the director of the Student Health Center, has worked in the T3 building for the past nineteen years. Even though that space wasn’t specifically built to be a health clinic, Kreisberg appreciated how it was a light-filled and welcoming space. With an enlarged facility, there will be opportunity to implement more services such as vision and dental screenings. They will also offer the meningitis vaccine during registration by partnering with Rite Aid. 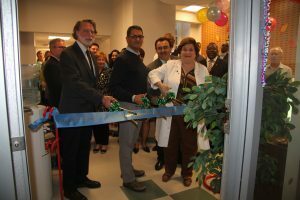 The health center currently offers clinical services with a nurse practitioner providing women’s health services, primary care through Ms. Kreisberg, a medical director who provides clinical oversight as well as patient care, and a nutritionist. Other ancillary services include, free HIV testing, blood drives, periodic CPR trainings, and an annual health fair. The health center also administers immunization clearance for registration. Recently, the center has acquired an electronic medical record system in order to comply with the state’s e-prescribe mandate, and have chartless medical records. Ms. Kreisberg is hopeful to go-live for the Fall 2017 registration; a student-patient portal, that will afford students the ability to electronically submit their immunization records to expedite registration clearance. Other features will include access to print-out immunization records and the ability to make online appointments. Lehman College is one of only two CUNY Colleges, (Brooklyn College is the other) that has a student health center that is wholly funded by the students through their campus activity fee. The center carries low cost prescription and over-the-counter medications for students, regardless of whether they have health insurance. They also have a health navigator working to help students apply for health insurance and food stamps.